It's still painted bright orange with a white stripe and the nose of fuselage is a bit longer, but the third generation HH-65C Dolphin helicopter is more reliable and powerful. "Although the helicopter looks about the same," said Cmdr. Stu Merrill, executive officer of Barbers Point Coast Guard Air Station, "as seen here over the past 20 years, it is now 40 percent more powerful." That translates into reliability, said Rear Adm. Sally Brice-O'Hara, commander of the 14th Coast Guard District. She noted that engine reliability in the second generation or Bravo model of HH-65B helicopter had become an issue. The Coast Guard has said that there were 174 power losses in 2004 compared to 55 in the previous three years. Merrill said that power losses means that one of the two helicopter's engines failed in flight. That has happened at least once with one of the four Bravo HH-65 helicopters assigned to Barbers Point, Merrill said, but it never occurred during a rescue mission. "In flight, an engine failure really tests the ability of the pilots," Brice-O'Hara added. "It was clear that something needed to be done." The Coast Guard admiral said the upgrade of the agency's 95 helicopters was included in its Deepwater Programs at a cost of $355 million. The changes amounted to $3.7 million for each HH-65 Charlie version. The goal of Deepwater is to replace and modernize the Coast Guard's aging fleet of deepwater-capable ships and aircraft. It is the largest and most complex acquisition effort in Coast Guard history. So far, 49 Charlie models have been delivered to Coast Guard air stations, including the one at Kalaeloa. The Charlie aircraft will perform a wide range of Coast Guard missions, including search and rescue, homeland security, drug interdiction, law and treaty enforcement, and marine environmental protection. The helicopter's two engines were upgraded with Turbomeca Arriel 2C2-CG turboshaft engines along with its the main transmission gear box and its cockpit systems displays. Lt. Gene McGuiness, who has been flying helicopters for four and a half years, said the increased power means it can carry more weight -- increasing from 9,200 pounds to 9,480 pounds. That results in carrying six passengers instead of three. "This airframe is solid," add McGuiness, who has 3,000 flights hours in HH-65 and H-60 Jayhawk helicopters. "You get the response when you need it." Petty Officer Erica Strocchia, rescue hoist operator and helicopter mechanic, said the Charlie model is easier to service because "everything is more accessible. "We can do engine changes a lot faster," said Strocchia, who has been working on engines for the past three years. Lt. Cmdr. John Williams, an HH-65C pilot, said last month a Charlie model helicopter was able to rescue an injured hiker from a Pacific Northwest ridge at 6,000 feet. "The air is much thinner," Williams added, "and the engine produces less power. A Bravo engine is not powerful enough to hover at that altitude." 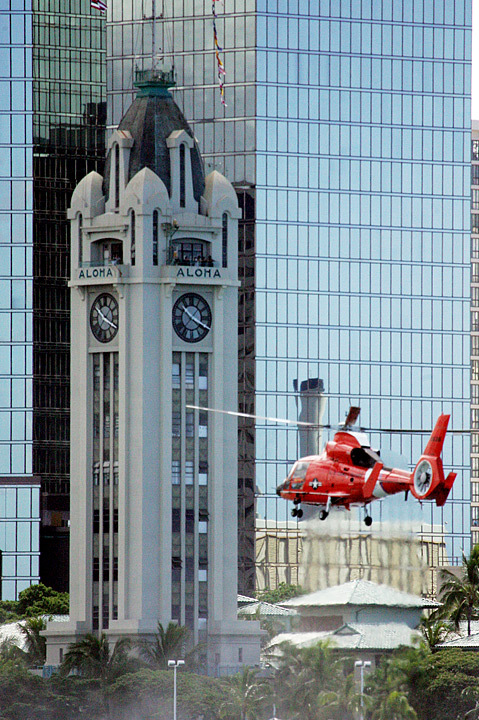 Merrill said with the newer Charlie model helicopters Coast Guard pilots can take patients directly to the helipad atop the Queen's Medical Center. "Until now we had to land at the airport and take the patient to the hospital by ambulance." Brice-O'Hara said during last year's Hurricane Katrina recovery efforts, the Coast Guard using HH-65B and H-60 Jayhawk helicopters picked up two-thirds of the people rescued or evacuated or about 33,000 people. The Coast Guard admiral said that the two cutters -- Rush and Jarvis -- home-ported at Sand Island deploy with a HH-65C aboard to help with its worldwide maritime missions.